Whether you're looking to package honey, sauces, beeswax candles or a skin care line, SKS has a great selection of glass and plastic beekeeping containers for all of your apiary and honey products! From packaging raw honey to flavored or creamed honey, we have a great selection of glass and plastic honey containers that may be ideal for your bulk and retail honey products. 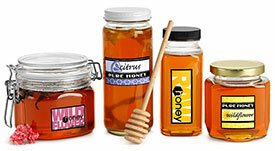 Choose from glass honey jars, plastic honey containers and more! 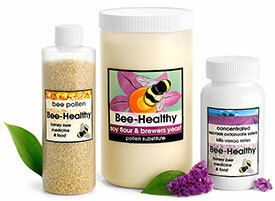 If beekeeping is your hobby or full-time occupation, you know how important it is to have healthy bees! We have a variety of plastic bottles and jars that could make great bee care containers for your bee food, bee medications and more! SKS carries a variety of glass and plastic bottles and jars that could be perfect for honey sauces, skin care products, beeswax candles, apitherapy supplements and other honey products. These are just a few of the beekeeping container ideas we have come up with. Be sure to browse our site for other containers to package things such as bath and body care products, bath salts, lip balm, candles, cosmetics and more! If you have additional questions or comments, feel free to send us an email by clicking here.